They brighten up the postcard racks in the streets of Lisbon; the many cards of the egg yolk coloured Tram No. 28. Always captured in beautiful morning or evening light while meandering the narrow streets of Alfama. 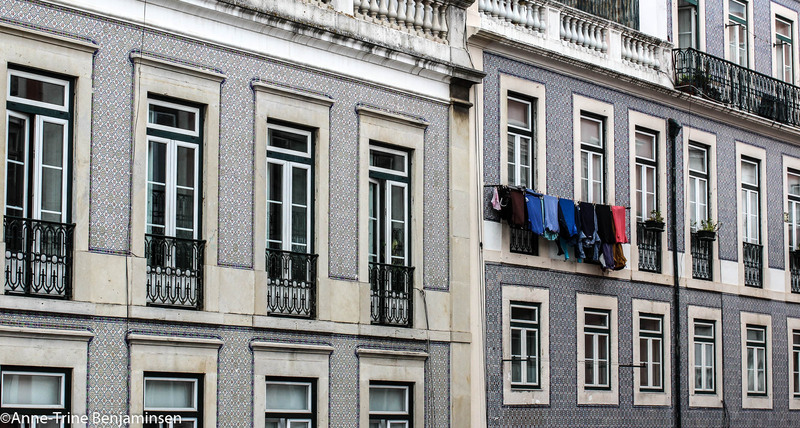 The yellow tram has become the very symbol of Lisbon, and blends perfectly with the charming cityscape of narrow cobblestoned streets, beautiful tiles and flapping laundry. 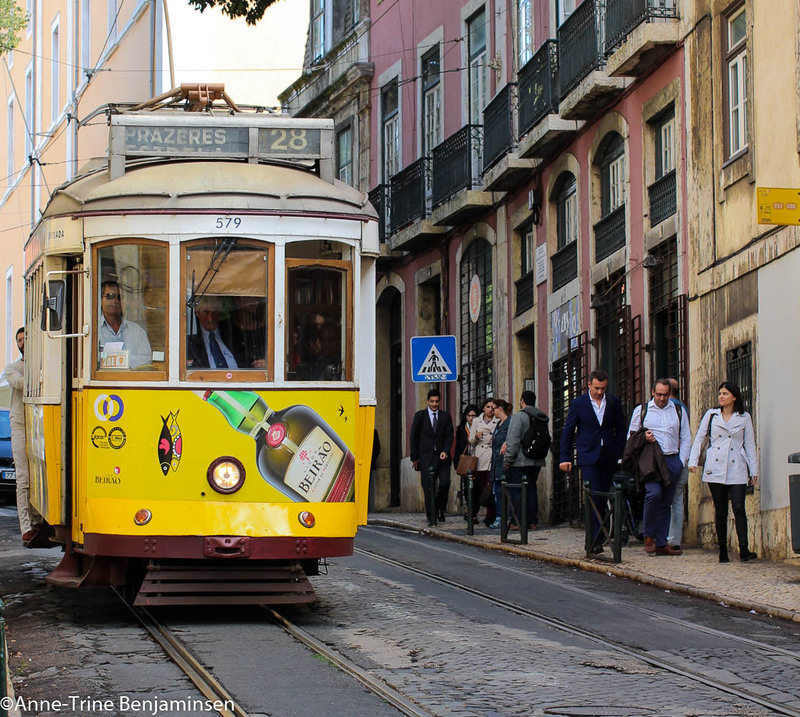 If you walk along the tram tracks from Alfama to Bairro Alto, you’ll meet ‘No. 28’ sooner more than later. Sadly, most of the Lisbon trams are almost covered with advertising and not as dazzling yellow as shown on the cards. For a long time, Jameson’s whiskey came to mind whenever I thought of Lisbon. The trams of Lisbon were imported from the United States in 1901 in order to replace the old carthorses. The route 28 was inaugurated in 1914. In 1959, there were altogether 27 tram lines in Lisbon, but the construction of the metro and the expansion of the bus lines eventually sent the trams into decline. 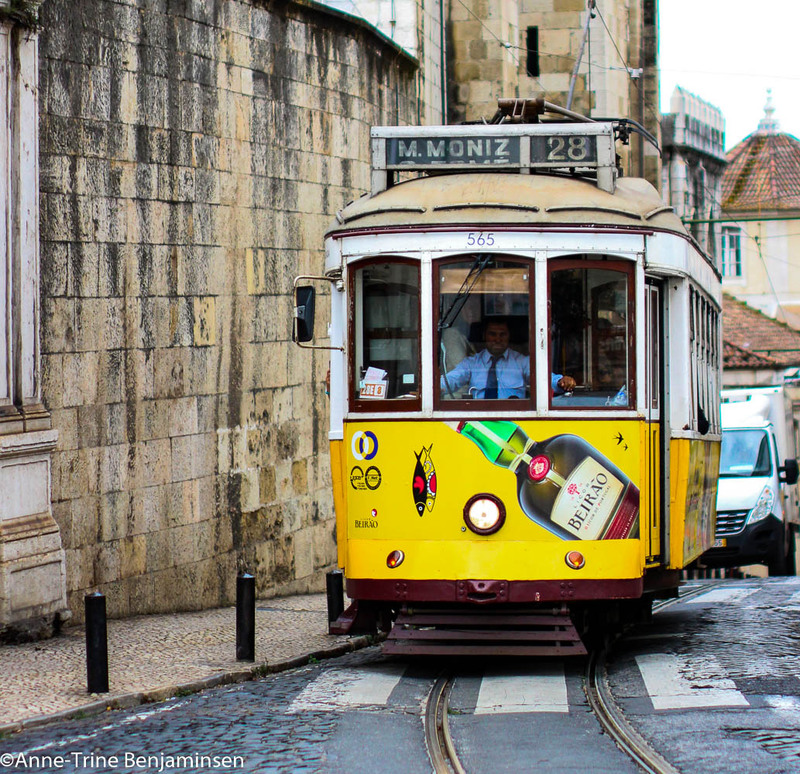 Today, Lisbon has five remaining tramlines. No. 28 is meant to be the jewel of Lisbon’s streets. 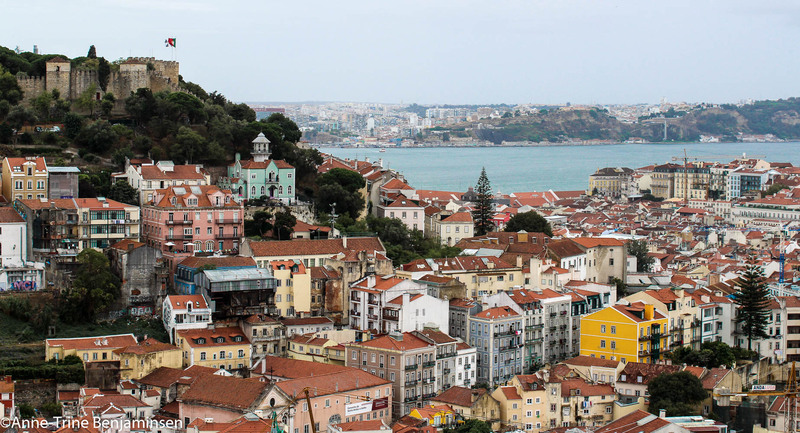 It takes the passengers on a 40-minute ride through old neighbourhoods such as Graça, Alfama and Baixa, along many historical highlights, including the cathedral and the castle. At the same time, it’s part of the city’s public transport network, but may seem as transportation for the city’s many tourists only. Whenever you catch a glimpse of it, it seems to burst and the passengers do not look like ordinary residents. 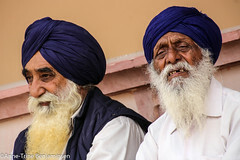 They have rucksacks on their backs and a camera on their fronts, they fan themselves with maps and keep travel books tightly under their arms. Nobody pretends to be anything but what they are; a tourist who does what the travel guides claims to be “an absolute must.” Passengers are hardly on their way from A to B, it is the journey itself that matters. Those who have been lucky enough to get a seat can make the most of it since they don’t have to worry about losing their balance. The large windows are mostly open, a virtue of necessity since the air is thick, but the open windows also give the passengers some photo opportunities. With cameras at arm’s lengths, they capture the view as the tram harks up and down the narrow streets. Surely, they must also be capturing other tourists doing exactly the same but in reverse; taking pictures of the brimming No. 28 from the sidewalk. It is a dark and quiet evening, the rainfall makes the air a little cool. Tired, we’re waiting for No. 28, a tram seemingly without a fixed timetable, but supposed to run every ten minutes. And then, after the longest wait, we can hear it in the distance. There, it slips around the bend just before the small hill and wearily creeps towards us. We triumph, now we’ll sit all the way up to Graca and enjoy a quiet ride home. At this hour, the tram is bound to be empty. It was not! What could possibly Lisbon and Calcutta in far-away India have in common? From my room with a view!